While visiting the Outer Banks, we made a trip over to Roanoke Island. Here we found a wonderful replica of the Roanoke Marshes Lighthouse. The original lighthouse was a screw-pile cottage style light that stood in the bay on the southern edge of the island. 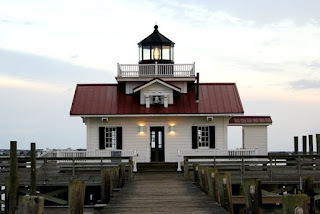 It fell into the Sound when it was being moved and in 2004 the Town of Manteo dedicated a replica of the lighthouse. 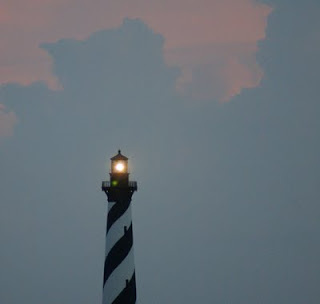 Did you know that the lighthouses of the Outer Banks are each painted a different design so that the ships could easily tell where they were in relation to the coast? 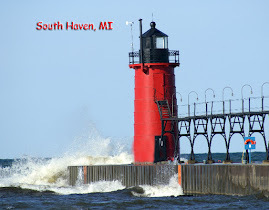 In the 1800's when these lighthouses were built they didn't have the navigational guides that are available today, designing each lighthouse differently was a great aid to the mariners. Ocracoke Island is a wonderful place to visit. It has a beautiful lighthouse, which is one of the oldest working lighthouses in North Carolina. In addition, it is a wonderful quaint small town with great little shops and restaurants and some of the best beaches in America. In fact in 2007, it was named America's #1 Beach ! 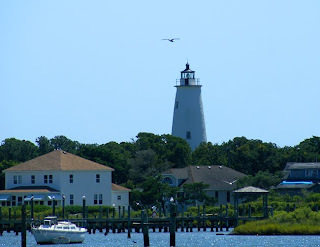 In this lens Ocracoke Island , I take you on a pictorial view of the island. Enjoy!